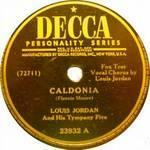 "Caldonia" is a jump blues song, first recorded in 1945 by Louis Jordan and his Tympany Five. A version by Erskine Hawkins, also in 1945, was described by Billboard magazine as "rock and roll", the first time that phrase was used in print to describe any style of music. In 1942, Jordan had started on an unparalleled run of success on the Billboard Harlem Hit Parade (forerunner of the R&B chart), which by 1945 had included four number-one hits, and eventually made Jordan by far the most successful R&B chart act of the 1940s. "Caldonia" became his fifth number one on what was at that point called the "Race Records" chart. It debuted on the chart in May 1945 and reached number one in June, where it stayed for seven weeks. On the pop chart, the song peaked at number six under the title "Caldonia Boogie". Jordan re-recorded the song in 1956, arranged by Quincy Jones and featuring torrid guitar work by Mickey Baker. (1964) "The Things That I Used to Do"
At the same time as Jordan's success, the song was also recorded both by Erskine Hawkins and Woody Herman. The issue of Billboard magazine for April 21, 1945, described Hawkins' version as "right rhythmic rock and roll music", possibly the first use of the term to describe a musical style, and pre-dating by 14 months a more often cited use of the words in a June 1946 description of "Sugar Lump" by Joe Liggins. Hawkins' version of "Caldonia", featuring piano and vocals by Ace Harris, reached # 2 on the Billboard R&B chart and # 12 on the pop chart. Herman's version, arranged by the young Neal Hefti, reached # 2 on the pop chart. In later years "Caldonia" was covered by Sugar Chile Robinson, B. B. King, Muddy Waters, Bill Haley, Carl Perkins, The Band, Van Morrison, Tito Jackson, Bad Manners, Willie Nelson, Memphis Slim, Matt Minglewood, Downchild Blues Band, and Slapback Johnny among others. James Brown recorded it in 1964 as his first release for Smash Records. His version, featuring an arrangement by Sammy Lowe, charted #95 Pop. In 1967 Mickey Baker again recorded the song, this time backing up Champion Jack Dupree. 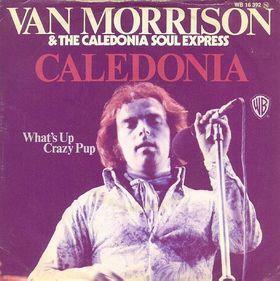 Dutch and Italian pressings of Van Morrison's version of the song incorrectly showed the title as "Caledonia" (understandable since Morrison chose to credit his backing musicians as the 'Caledonia Soul Express'), but the error was that of the record company, not Morrison. The song was also referenced in the Mel Brooks' comedy film History of the World, Part I (1982). Library of Congress essay on Jordan's version. "How Blue Can You Get?"